Last week on the Caracas Chronicles blog, Juan Cristobal Nagel wrote a remarkable post. He lamented that he had become a cheerleader for the Capriles campaign, drawn into the opposition bubble that was convinced Capriles was going to win. The post is worth reading not only for its admirable candor and reflection, but also for Nagel’s description of the value-added process by which he was led into the bubble. He tells how, after he posted a piece critical of Capriles, he was taken aback when a member of the Capriles campaign said he needed to decide if he was a “friend or enemy.” Overtime he realized that he did indeed feel a strong affinity for the campaign’s basic themes and communicated frequently with friends he had on the campaign staff. This led him to lose his critical edge, ignore the polls that showed Capriles way behind and focus on the one that showed him ahead. The post gets at two of the core elements of political polarization in Venezuela during the Chávez period. The first element is the logic of friend or foe. During the Chávez period both Chávez supporters and opponents have tended to think they are fighting for their lives against a political power that seeks to eliminate them. Thus constructive criticism is considered treason, and “loyal opposition” is simply a contradiction in terms. In Venezuela, if you support candidate X, you not only hope that he or she wins, you publicly claim that he or she will win. Anything less reveals you as lacking resolve or as being of questionable integrity. In addition, if you can put forward some new theory about how and why your candidate is going to win, you become something of a hero. Of course, none of this is unique to Venezuela. Watch CNN for an hour during this election season in the US and you will see spin from both sides: from Obama and Romney campaign officials as well as the columnists that support them. What is unique to Venezuela is how far this logic of spin extends into the public sphere among journalists, academics, and other opinion makers. If you just take a look at one newspaper, El Universal, and some of the titles of the opinion articles the two weeks before the election you will see that the hype of an inevitable Capriles win was deafening. Authors applauded a people who had finally turned against Chávez: “Venezuela Wants Progress" Santiago Quintero (October 1); “Venezuela Wakes Up and Reacts" Emilio Graterón (October 1). And they triumphantly proclaimed that Capriles would win: “The Final Stretch, Capriles Is Winning!“ Flavia Martineau (September 29); “Capriles and the End of the Story,” Asdrúbal Aguiar (September 25). Some commentators went a step further to focus instead on the margin that Capriles would win by, hoping that it would be large enough to overcome fraud and have a clear mandate for change: “Capriles: The Avalanche Effect,“ Roberto Giusti, (October 2); "The Gap is the Challenge,” Claudio J. Sandoval, (October 4). Other authors focused on sending off Chávez into history: “Rest, President" Francisco Gámez Arcaya (September 26); “Well, Goodbye Chávez,“ Francisco Olivares, (September 29). Of course others worried that Chávez would not accept his impending loss, "And if He Doesn’t Give Up Power?” Adolfo R. Taylhardat, (September 26), and warned Chávez that this would be costly “Fraud Is Not Free,“ Yon Goicoechea (September 25). One could expand this symphony with innumerable other articles from multiple media outlets that analyzed every imaginable implication of the coming Capriles victory. Of course here and there you could find discordant opinions, but they were drowned out by this overwhelming triumphalism. None of this should be taken as an endorsement of Venezuela’s state media which I think is even more homogeneous and more misleading. However, the private media has more impact than state media and, in recent years, it has systematically misguided the opposition. The second, closely-related element of polarization in Venezuela is the echo chamber effect. Polarization in itself results in and is reinforced by what can be called “network isolation”–the tendency for people to talk to people they agree with, rather than with people of diverse opinions. Network isolation produces an echo chamber in which everybody agrees, reigning ideas are never challenged, and the sentiments and opinions of people outside of the network are systematically occluded. Most of the articles mentioned above are written in terms of “we”—not “we in the opposition,” nor “those of us who oppose Chávez” but simply what “we” think, and what “we” need to do, under the assumption that all readers are unified in their political perspective. Of course to a certain extent this is the human condition; very few people maintain diverse networks and it is easy to lose touch with the larger population wherever you are. In most contexts, opinion polling helps people break out of their bubble and acknowledge the actual distribution of political preferences in their society. However, in Venezuela, polling itself is polarized and largely contributes to the echo chamber. As Iñaki Sagarzazu has argued, some variation in polling is normal. But the extent of variation in Venezuela clearly is not. Differences in methodology and sample can lead firms to differ by two or three points, but not twenty or thirty. Nevertheless, this does not mean that one has no analytic recourse and should simply pick the pollster that gives the most appealing results. In a context in which it is well known that polling firms make deals with political parties, it should be clear that you want to regard the extremes with some skepticism. I started this blog by defending Consultores 21 as one of the two most reputable pollsters in Venezuela and trying to reconcile their polling results with those of Datanálisis. I stopped defending them when I heard from several independent sources that Consultores 21 was working with the Capriles campaign, and after seeing Iñaki Sagarzazu’s analyses, (see Table 1) showing them to be the least accurate of all the pollsters he evaluated. They have not hit six out of seven elections as they recently claimed in a mea culpa. They were twenty points off on the 2004 referendum and more than ten points off on the 2009 referendum. In contrast, the pollster with the best record over the past twelve years had Chávez in a strong position throughout the campaign. And their most robust statistic for predicting elections suggested a victory of ten points or more. 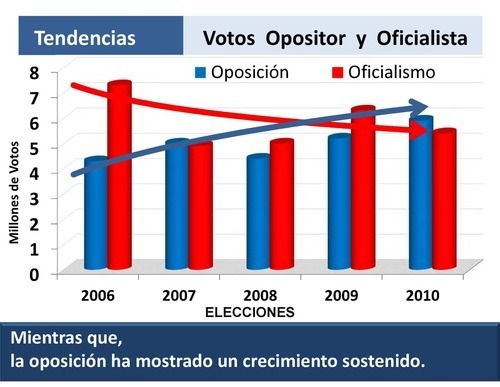 Figure 1 shows that since 2000, Chavez’s job approval rating in Datanálisis’s Omnibus poll has either predicted the pro-government vote right on the nose or overestimated it by 1-3 pts. 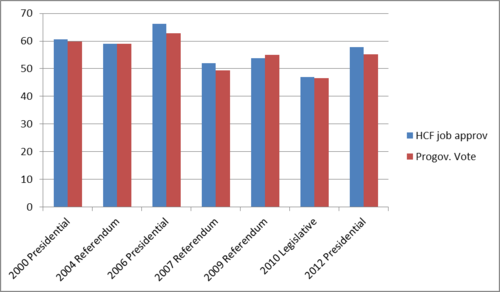 Only in the 2009 referendum did it underestimate the pro-government vote. In Datanalisis’s last three Omnibus polls before the election, Chavez’s job approval ranged from 55 to 61%. So the track-record of this statistic suggested a strong probability that the pro-Chávez vote was going to be in the mid-50s. Indeed, looking exclusively at voter intention is not usually the best way to think about probable results. Rather, it is better to dig in to look at some of the fundamentals of public opinion and how they compare over time. One of the most popular theories in the opposition echo chamber was the idea that the opposition was on an inevitable upward trajectory—as can be seen in Figure 2, a graphic that formed part of one popular analysis that circulated on the internet. But a few simple comparisons between 2010 and 2012 were enough to see that Chavez was in a much stronger position in 2012 than he was shortly before the 2010 legislative elections. In Table 1 we can see that Chávez’s job approval was approximately ten points higher in August 2012 than it was in August 2010. His trust numbers had improved by seven points, and more importantly were fifteen points ahead of Capriles’s numbers. Personal optimism—which is largely a derivative of economic growth—had increased by 18 points. And while the opposition had the advantage over the government in party identification in 2010—a key element for voter mobilization—by 2012 the government had close to double the opposition’s numbers. This just goes to show that accurate polling is possible in Venezuela. The problem is that only a few pollsters have decided on a business model that is based on a track record of accuracy. Many, perhaps most, sell results to the highest bidder or see themselves as part of a partisan political project. This will never change until citizens demand accountability. The efforts of Iñaki Sagarzazu and others to make public the track records of pollsters and their typical biases is perhaps the most promising path. What gains the opposition made in the 2012 presidential election came because the Capriles campaign did not, as past opposition campaigns have, start with the assumption that it represented a majority. Rather it sought to create one by putting foot to pavement, breaking out of the bubble and talking to people about their real needs. In the process it forced the Chávez government to likewise address the needs and desires of average folks. If further progress is to be made in Venezuelan democracy, it will require polling companies and media outlets that actually mediate popular sentiment rather than trying to create it, and citizens that hold them accountable for their work.